Danish architecture firm Rosan Bosch has developed this incredible playful space for the Swedish Free School Organization Vittra. The school wanted to have a space without walls that stimulates the children’s creativity, “where the physical space is the school’s most important tool in their everyday and pedagogical development”. Five learning spaces were created to accommodate the various situations that children and teacher are facing in a regular day at school (though nothing seems regular about that school). The spaces are: ‘The Cave’ (a private space for learning), ‘The Lab’ (experimentation and practical work), ‘The Camp Fire’ (group process), ‘The Watering Hole’ (a place for encounters and impulses), and ‘The Showoff’ (a stage to show off progress and discoveries). Apart from being such an colorful, playful and engaging space (which is always a PLUS in any work related enviromnet and I will talk about it in one of my next posts), what interests me most about this project are the social and behavioral implication. How the various spaces, compositions, textures, colors and overall atmospheres of a space like that contributes greatly to the overall happiness of the people living and working in it. I’m curious to find out more about the level of happiness, physical and mental well being and performance of children and staff. What sense of self does a child develop in this environment. 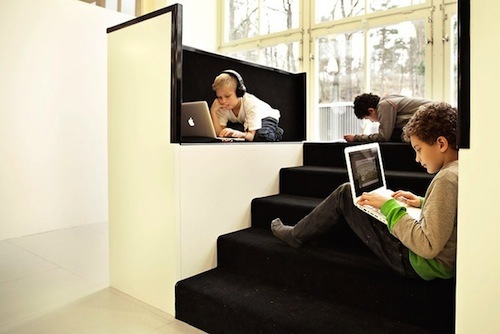 How adapt is a child learning and growing in such an open space. Will children be more open (minded), more understanding, more collaborative human being when they go out in the world? I’d be surprised if not. Hopefully this example from Stockholm will inspire other decision makers all over the world. You are currently reading School without walls at Brand Experience Strategies & Cultured Projects.